Will changed quite a bit of the 88A/93A area, which was also the part I fought the hardest in the filling process. Elsewhere, 26A & 70D have new answers also. I admire those constructors who go low on Sunday puzzles. I still struggle with 144-word grids for Rich & Patti. I try my best not to waste long slots and avoid those wobbly fill, but sometimes the grid won't cooperate. Jobs "framing" themers, split so they appear at the beginning and end of the phrase. Nice finds with ACTUARY framing ANIMAL SANCTUARY and BARBER framing BARBARA BOXER. It's cool to see these longish professions at the ends of these in-the-language phrases. I always admire C.C. 's inclusion of colorful long fill, and I'm impressed at how many modern entries she chooses. I'm not sure that AMAZON ECHO will last — will it go the way of the AMAZON FIRE phone? — but in Seattle, we hear a lot about what Amazon (and Microsoft and Google) are up to. WTA TOUR (Women's Tennis Association) isn't as modern, but what a great entry that highlights women's tennis. Serena is such an incredible athlete. SILLY GOOSE isn't modern at all, but it's a fun entry that added to my solve. At first I thought the shorter professions like MAID and COOK weren't as interesting because the MA___ID or CO___OK patterns are easy to fill. To my surprise, I couldn't find that many on first glance. So kudos for these finds. Some of the themers felt forced though — PLATE NUMBER and PRIOR ARREST in particular. I see that these are real terms, but they don't feel nearly as zippy as CLEAN AND JERK or MAIL FRAUD. People more write down a "license plate" and talk about "priors," right? I can see a case for PRIOR ARREST, but "he has one prior" seems much more colorful than "he has one prior arrest." Would have been nice to get a few modern professions, too. Maybe a CODER? A QUANT? Pretty clean puzzle, although I would like to see C.C. continue to reduce her number of gluey bits like BAR OF, I LET, AS I. REMS and GEDS are pretty awkward plurals too. 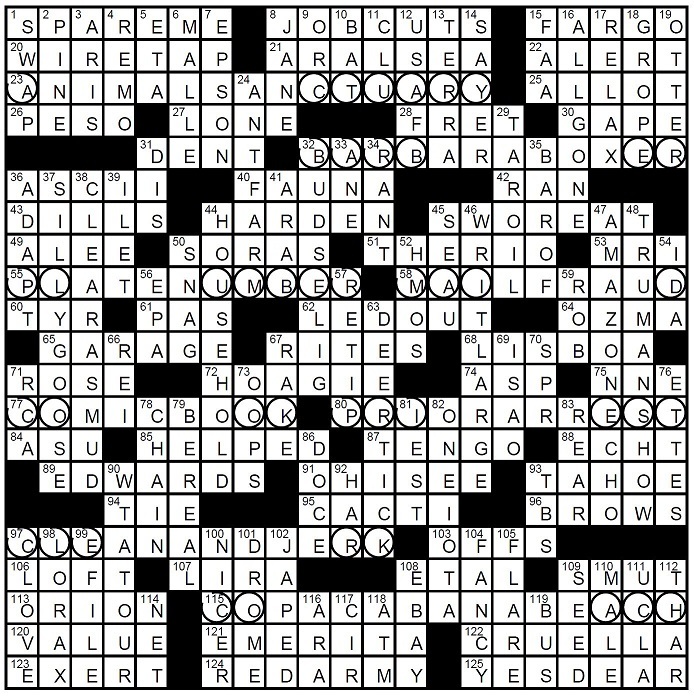 It's so tough create a super-smooth Sunday 140-word puzzle. Average word length: 5.24, Scrabble score: 587, Scrabble average: 1.60.